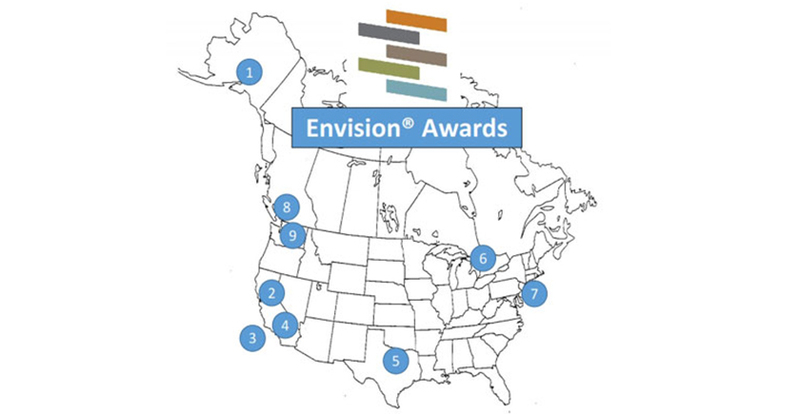 By the end of 2015, nine projects earned Envision awards. These projects represent a variety of infrastructure types across the US and Canada. Water pipes, wastewater treatment plants, stormwater systems, roads, energy generation, and more. Nine projects have completed third-party verification and received awards across the US and Canada as shown in the illustration. The William Jack Hernandez Sport Fish Hatchery, Anchorage, Alaska, received an Envision Gold award in July 2013. This brownfield redevelopment incorporated sophisticated recirculation technology that reduced the water and energy normally used by conventional hatcheries by 95 percent while supporting sport fishing industry. The project restored and improved a public park-like setting and viewing areas with trails, boardwalk, and educational signs while protecting the on-site stream. The Snow Creek Stream Environment Zone Restoration, Placer County, California, earned an Envision Platinum award in November 2013. Another brownfield restoration, this project also restored historic wetlands and the stream environment zone by removing fill and debris and reestablishing vegetation and wildlife habitats. This project also created a public park with walking paths. The South Los Angeles Wetland Park in the city of Los Angeles, California, earned an Envision Platinum award in January 2014. The purpose of the wetland was to enhance the quality of stormwater runoff by treating runoff from a 525-acre contributing watershed and create a new public park in a community with little green space. The Sun Valley Watershed Multi-benefit Project in Los Angeles County, California, earned an Envision Platinum award in August 2014. The project consists of several improvements in the watershed to manage stormwater runoff, provide flood protection, improve watershed health, increase open space and recreational opportunities, and increase wildlife habitat. The Line J, Section 1 Pipeline in the Tarrant Regional Water District (TRWD) of north central Texas earned an Envision Silver award in October 2014. This two mile, 108-inch diameter pipeline delivers water from reservoir for use to meet potable demand. The project improves the ability to meet growing water demands and future projections. The Grand Bend Area Wastewater Treatment Facility in Ontario, Canada, on the shoreline of Lake Huron, earned an Envision Platinum award in February 2015. The project expanded the capacity of the facility by converting an existing lagoon into an extended aeration mechanical treatment facility and wetland nature reserve. 26th Ward Wastewater Treatment Plant in New York City, New York, earned an Envision Silver award in August 2015. The project added setting tank and pumps to expand treatment capacity as well as incorporated other upgrades to improve resilience at the existing treatment plant. Low Level Road in Vancouver, Canada, earned an Envision Platinum award in September 2015. The project involved the realignment and elevation of approximately 2.6 kilometers of road providing space for two new rail tracks and eliminating three existing road and rail crossings to provide direct access to major port terminals. Tucannon River Wind Farm in Columbia County, Washington, earned an Envision Gold award in November 2015. The wind farm includes 116 turbines atop 80-meter tubular steel towers and produces an average of around 101 MW.